Zoe and Adam went for a moonlit stroll through the park. All around them dark trees hovered and blackness stretched out before them. Gray clouds hid the moon and stars and hinted of rain. "It's different walking in the park at night than it is in the day, isn't it?" Zoe looked around her. "In the day you see children playing, birds flying about in the treetops, butterflies fluttering from flower to flower and ducks swimming in the pond. At night all you hear are owls hooting, crickets chirping and the wind blowing," Zoe said. "That's true, but at night you can really hear things. Let's sit on the park bench and listen carefully." Adam took Zoe's hand and they sat. "What do you hear?" Zoe didn't say a word for a few moments. She simply listened. "Oh, I hear frogs croaking in the lake." "Is that all?" Adam closed his eyes. "No, I hear cats meowing too." "I hear a mama humming a lullaby to her baby. That's sweet," Zoe said. "I hear someone clanging pots and pans around. They must be making hot cocoa. I hear squirrels running through the dead leaves, someone's television; I think they're watching the news, and oh, I hear the beating of my heart." Adam smiled at Zoe. The two of them glanced at the trees. "Look, Zoe. The clouds are parting. There's the moon." "There's the man in the moon. Do you believe there's a man in the moon, Adam?" "I do. Look at him. He's smiling down on us." The sky cleared and the first star appeared. 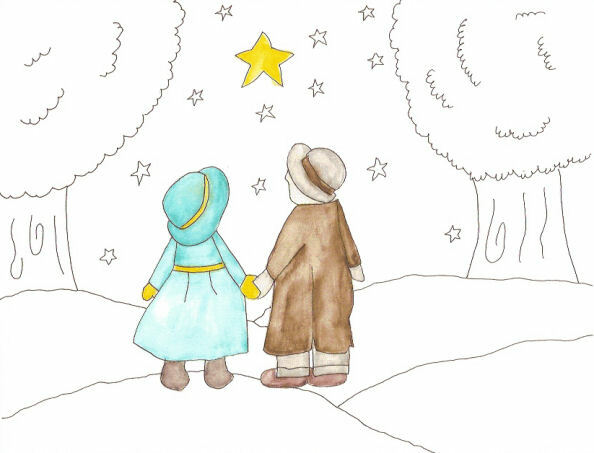 Adam took his wife's wrinkled hand in his and they gazed up at the star. "I'm going to make a wish." Adam closed his eyes. "There." "What did you wish for?" Zoe giggled. "You make your wish first," Adam said. Zoe closed her eyes. "All right. I've made my wish. Now tell me yours." "I wished that we'd have another fifty years together so we could walk through the park every night." Adam wiped a tear from his eyes. "I wished that too." Zoe lay her head on her husband's shoulder and the two of them sat in silence watching the stars twinkle.